Once started to design websites, people used to make it for fun, yet, since then things have changed dramatically. Today, everyone has the ability to build a modern website like a pro and increase their expertise over time. You can easily create a fully-functional website just because the technology is easy to learn and use. Being not tech-savvy is no excuse to not having a website. The best thing is that you don’t even have to learn how to code, you just leave all those technical complications behind. This is hardly a secret that the amount of WordPress themes abounds. Every minute new websites pop up in the market like mushrooms in the rain. How do you plan to cut through that noise? If you are serious about improving your online presence, head over to WordPress right away. 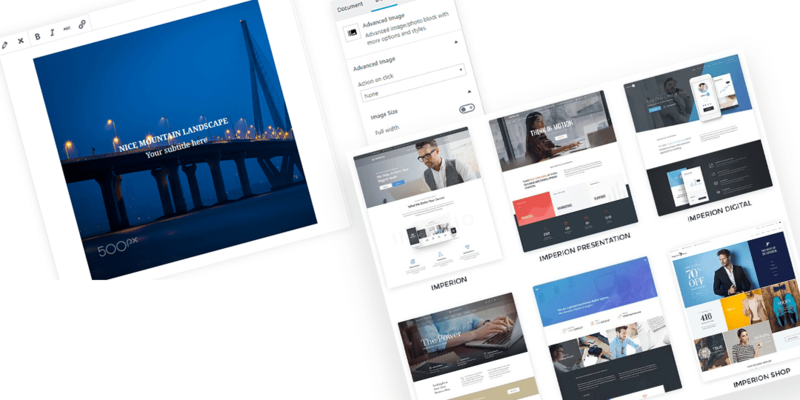 Especially, with Gutenberg editor on its way, getting WordPress 5.0 compatible WordPress theme is a key to win. Built for the new Gutenberg era, Advanced Gutenberg is a block-first plugin that gives you more control and new blocks that are missing in the default plugin. Thus, it provides you extra advanced blocks to improve your content creating experience. It offers you enhanced gallery, ability to edit controls, and even better - the power to apply custom CSS. And the best part is that it’s totally open source and free. Every time you need to create advanced buttons, look no further, Advanced Gutenberg will do the trick. The diversity of button settings may impress even the most skilled developer in fact. Thus, it includes settings for hover effects, padding, borders, zoom effects for Google maps, and the like. Looking for ways to attract more user action? Take advantage of a counter block. Control the appearance of your site with blocks that create tabbed content & show accordions, blocks for advanced image & videos, and the like. Head over to the Advanced Gutenberg > Configuration to find some general settings related to the gallery, images, and blocks. The idea behind the Advanced Gutenberg is simple - to improve the performance of the editor. Say, in case you need to create edition profiles and assign them to specific WordPress users or groups, Advanced Gutenberg is the solution. Wish to restrict the control of each user? No problem, enable/disable the access of each block. In fact, this option is unique. Need to display both your latest posts and WooCommerce product pages? No worries, there are always things you can make better. So, if you’re about to change your editing power, you can’t go wrong with Advanced Gutenberg. Think that it’s difficult to start a professional website? Think again. Planning and building a website is far from making your brain hurt. Instead, it’s an extremely satisfying and creative adventure. Moreover, with the right tool under your sleeve, you’ll make the ride smoother and more enjoyable. Once you go for Imperion WordPress theme, your site-building adventure will be no different. First and foremost, crafted with care for business and corporate websites, Imperion comes with an outstanding design that sticks out a mile. Second, when you have a business that strives for complete satisfaction, wouldn’t you want your website to do the same? Imperion has everything you might need to turn your website into a profit-generating tool for your business. Built with Elementor page builder, it does its work on a different level. It allows you to get creative with new unique layouts & save so much precious time and efforts. So, build amazing posts and pages live, without any lag or delay. In times where everyone has a smartphone, a mobile-optimized website is a must. Imperion features a truly responsive design that adjusts correctly to all screen sizes of modern devices. As a result, your website is more likely to appear top of search engine results. So, you skip a lot of the time-consuming work from day one. Indeed, your website needs to be a cut above the rest. To help you out, Imperion offers you to take advantage of its robust functionality and get started quicker. Still in doubt? Just look around - amazing services sections, stunning portfolios, testimonials, team members, just to name a few. That’s where you have to get inventive. Apart from that, it comes with 5 beautiful homepage layouts ready to go-out-of-the box. Enjoy switching between the ready-made designs before sticking to one winning design formula. When it comes to extended functionality, JetElements plugins can be a huge help. It offers you a set of extra modules such as Brand, Carousels, Post Sliders, and the like, to spice up your website to the next level. Want to create a fully responsive mega menu with dropdown items? No worries, JetMenu plugin is your greatest ally. Feel the freedom to add any modules right to the menu to get the best results with less coding issues. Looking for a product, service, promotion or anything in between? Chances are that you are more likely going online. Don’t miss out on a large chunk of potential customers without an online store. Since online marketing is always a huge method of driving traffic, the online store is a necessity in today’s world. Haven’t sold anything before? Fear not, Imperion has got you covered. Being WooCommerce ready, it makes it a breeze to add an online store functionality to your site. Take time to use the WooCommerce Package to the full. Minify as much coding issues as possible to market your products in a more clever way. In a space full of brown cows, your website has to be a purple one to get noticed by customers. To help your website stick out a mile, get all the help you need from day one. So, wait no longer and kick off your site-building adventure with Imperion. Tandem Imperion and Advanced Gutenberg can be beneficial to your business as it offers a fantastic experience to maximize the untapped potential of your website. In fact, money is the most significant reason why people used to build websites on their own. Sure, nobody likes paying more. But that doesn’t mean you can’t get the premium WordPress themes for less. No matter what niche you are trying to pitch yourself in, the partnership with TemplateMonster is way beyond what you could do.